Before upright and grand pianos were invented, the piano was basically just like a wooden oblong box with strings. Some had legs, some didn't, and mostly didn't have any pedals.... the "Square Piano" was named. In 1709 saw the first escapement piano mechanism invented by Christofori. Some very early squares from the 1600s had knee pedals. I've decided to cut to the chase, and start from around the mid 1700s showing the development of the piano in some kind of chronological order. If you have had difficulty in dating your piano (re serial number or lack of), this is the next best place to look. Dates are approximate. There was no exact cut-off date or year between different designs of pianos; many new designs overlapped old designs. Most early rectangular shaped pianos are described as square pianos, as we now know - however they did resemble a grand piano more than an upright piano because of their shape and horizontal strings. Very early pianos were often incorrectly named as a "piano", when in fact they were a harpsichord or clavichord. A piano MUST have hammers that strike and fall back from the string. The following information is a guide only, and does not replace the need for a proper face-to-face inspection of your piano. By providing just a piano name and serial number alone will not provide you with much information. When we watch TV programs like "The Antiques Roadshow" / "Flog it" and other similar programs, when someone wants to know more about that object, the expert will ask a few questions / pick it up (and hold its weight) / examine it in close detail / refer to other experts and research if needed / smell the wood / look out for specific kinds of wood joints, mouldings and ornamentation. Only then can an expert give a correct appraisal about that object. Even photos alone are not the answer, so if you think your piano is worth something, or you want to know more about it, why not book an appointment with a piano expert who will be more than happy to give you the right information from the start. Each category can have different models, sizes and style, but essentially any piano can only have one "type" name. The type of piano is determined by its overall shape. 4. Grand piano = horizontal / longer from 3ft. There are some pianos that like to call themselves an "upright grand" or even "cabinet grand" - however this is nonsense. Wording / decals / transfers on some pianos are sometimes printed onto the piano casework to over-exaggerate the piano's type - this is only a form of advertising, and may not tell you it's real type. So remember that a piano can only have ONE type, not a mixture of two or more different types. It's like saying a car is a saloon and estate...... only one or the other. Same with pianos. Early English Square Piano resembling a clavichord. Would have either no legs or legs that have been added later. 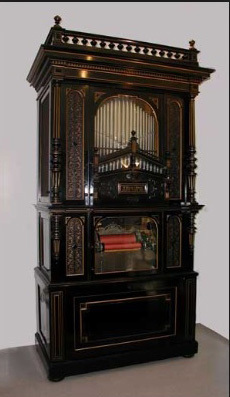 Cabinet was usually mahogany / short 3-4 octave keyboard with ivory & ebony. Spindle - style legs that unscrewed (wooden threads) for transportation on horse & carriage. Fallboard & music rest designs were more elaborate. Square pianos became much heavier looking and structurally more solid. Cabinets are "rounded off" at the corners (which came back in the 1950s for uprights). Pedal lyres and ornate 'cherub' turned legs saw the birth of the grand & upright piano. 4 -5 octave keyboards with ivory and ebony. Early grand pianos still resembled harpsichords, and designs were often mixed. Harpsichords had single strings and were plucked by a "plectra"
As other grand pianos took off in their design, the cabinet was generally very similar to all designs - even today! A more reliable method to date grand pianos is to inspect the legs, pedal lyre and stringing arrangement. Some early grand pianos like this had porcelain castors instead of brass and highly decorative music rests. Upright piano designs changed more frequently than grand pianos; because of their size and price, they are more popular in the family home. Some tall upright pianos had longer strings than grand pianos ! Various upright pianos had casework names like 'Console' (meaning a small upright), or 'Mini' , and 'Studio' .... some names relate to the height of an upright piano and described in relation to this. The correct way to describe an upright piano is by its height, measured from the side of the piano, from floor to top lid. 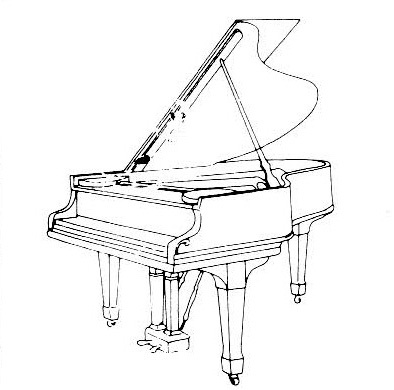 Some pianos are described according to their leg design (i.e. cottage piano) - not necessarily being smaller than a console, but the name taken from the period when built. pianos - cabinet pianos. Losing the 'square' look, some pianos had very tall cabinets. 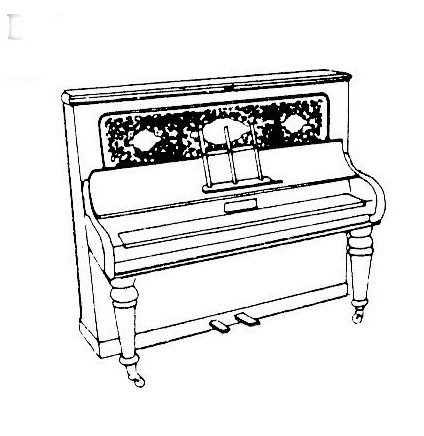 This example has been known to be nick-named the "giraffe" piano. material behind the glass. As the strings are now vertical, these were called vertical or upright pianos, and even "vertical grands". This was the heyday for the proper upright piano, still in existence today. (Above) Left: 1900s. Imported German pianos became popular. Superior quality and sound due to being over-strung. 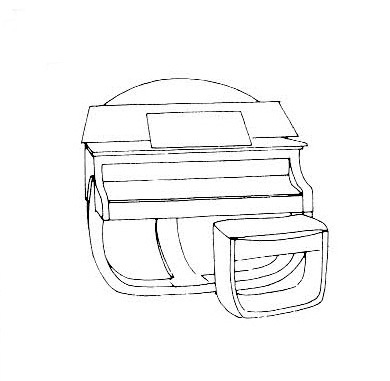 Round or square column legs, supported under the keyboard and secured to projected feet. Sides of the top cabinet trusses often matched the cheeks in a flowing line. Middle: 1920s: Good English made pianos/ over-strung and under-damped. In-turned curved legs, secured to the keyboard, bottom panel and feet. English names had a fold away concertina style music rest that hung from the top panel, inside top lid. Ivory keys less common and replaced with plastic acrylic or grained celluloid. Examples: Challen, Hopkinson. 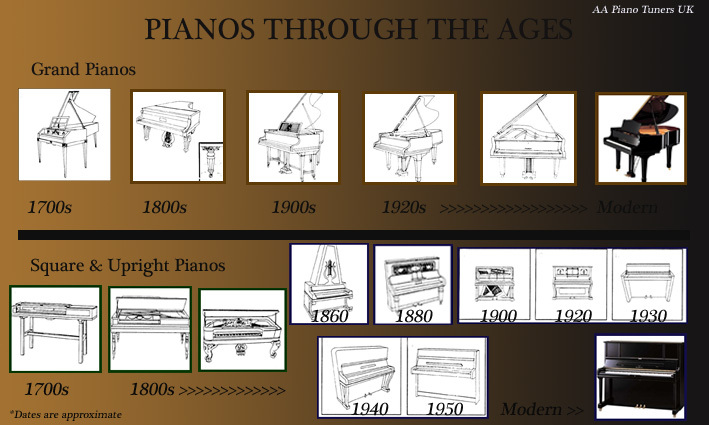 Above right: 1960s The emergence of the small modern upright piano, over-strung & under-damped. Over-damped pianos became obsolete around the 1960s and replaced with under-damped. Commonly referred to as "school pianos" (light oak) since these pianos were less attractive, and supposedly less appealing to be vandalised ! Use this simple chart below as an estimate to the outline and shape of your piano - just a guide only. Between various piano designs saw many innovations of the period when they were built. Some pianos did other 'jobs' - others sounded like a piano, but had no keyboard or piano look to it. Some pianos looked like a piano, but sounded like a music box. Many upright and grand pianos in the early 1900s were specifically designed with two internal mechanisms. Rear mechanism consisted of the hammers, undercarriages and dampers - like a normal piano. Front mechanism consisted of various air suction chambers, tubes, pipes, bellows and a central stack unit with a spool (tracker) bar and gears/ sprockets & chains. Specially designed paper rolls (with holes punched out) would be inserted onto the tracker bar. The pianist would simply pump two pedals with their feet to generate air suction, and the piano would play by itself. Fully working player pianos are becoming difficult to find now unless restored. The upright player piano (left above) has a sliding trap door at the top to reveal the winding paper roll, and the bottom trap door reveals the pumping pedals that fold out. When folded away, the player becomes a normal piano again. The front key rail is hinged and reveals a whole host of levers to play/ rewind the paper roll, and even adding expression to the music such as tempo changes, louds and softs, and sustain pedal - all activated manually by hand. A real working piano with hammers & strings, but no keyboard. Barrel pianos were popular at fair grounds as they were easily transported on two wheels. (Above) The 'pianist' would wind a crank lever, which would then turn a large internal 'music roll' barrel with metal tabs sticking out. Like a music box, as each tab passed the mechanism, it would connect with a hammer, which would then hit the string. Very difficult to tune accurately as each string had to be plucked by hand, and there were no dampers. Some barrel pianos have ornate mirror panels and have a repertoire of several tunes. 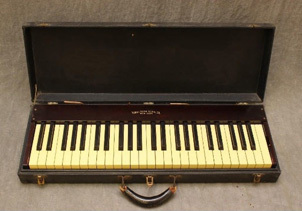 A practise keyboard with weighted keys in a "brief case" cabinet. on the Orient Express prior to their recital. A rare piano of museum quality with an extended bass lyre. strings. Many were highly ornamented with Japanese figures, pearl and gold pencilling. Background set on blue or crimson and chased with ormolu design/ open figure designs. Very elegant of the period, but nowadays cannot be played, only viewed through a glass case. Mechanically similar to a player piano with paper rolls, and sounding like a piano. piano, organ, bells and percussion instruments. 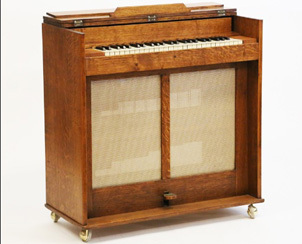 A cross between a reed organ and an upright piano. Some models were fitted with drums, cymbals, triangle and a Chinese gong for special effects.